This elegant gift box in black & gold is foil-stamped with your logo on the cover. 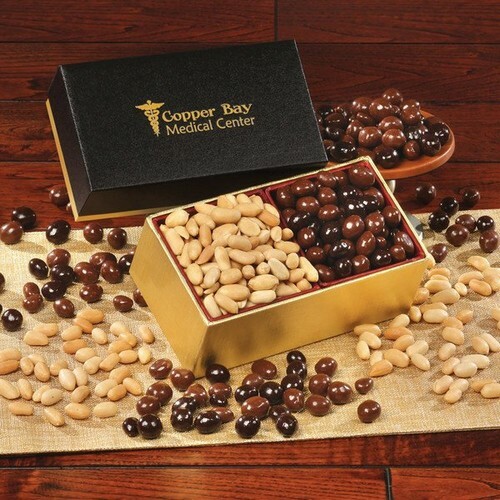 Packed inside are Choice Virginia Peanuts and Chocolate Covered Peanuts, six-ounces each. All quantities over 36 at this price. No other discounts apply.- Shipping not included. Gift cards available. Maximum size for enclosure cards: 6in x 3.5in . Production time: 7 working days. Orders utilizing individual drop shipment directly to recipients will be available for shipment 10 working days from factory's receipt of complete and accurate mailing list.